What’s Your Dry Eye Acumen? Dry eye therapeutics that every optometrist should know about. Only recently have most eye care providers come to recognize dry eye as a disease. 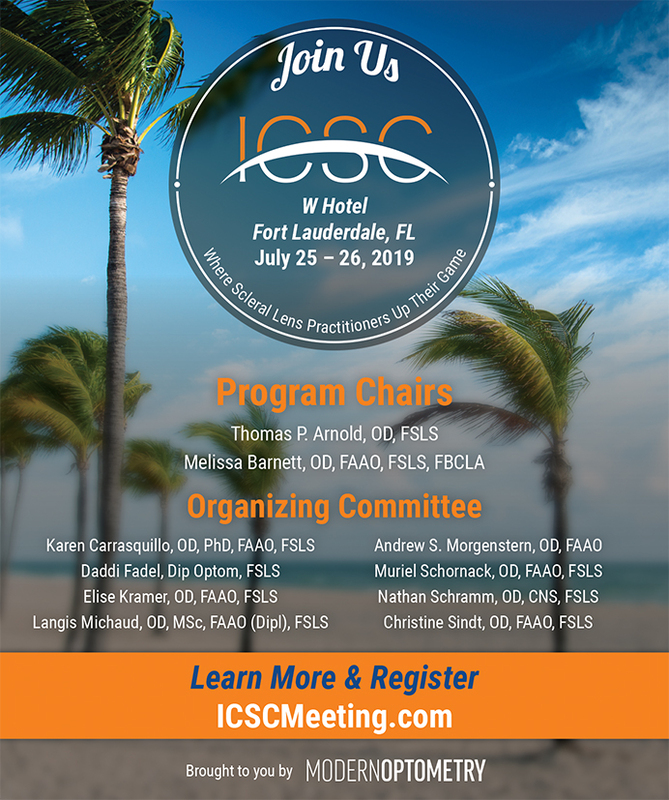 Thanks to years of research and dedication by the Tear Film and Ocular Surface Society (TFOS), industry members, and other groups and individuals, providers have begun to realize the complexity of this chronic, inflammatory, progressive condition. New ways of diagnosing and treating dry eye disease (DED) have been developed as a result of that realization. 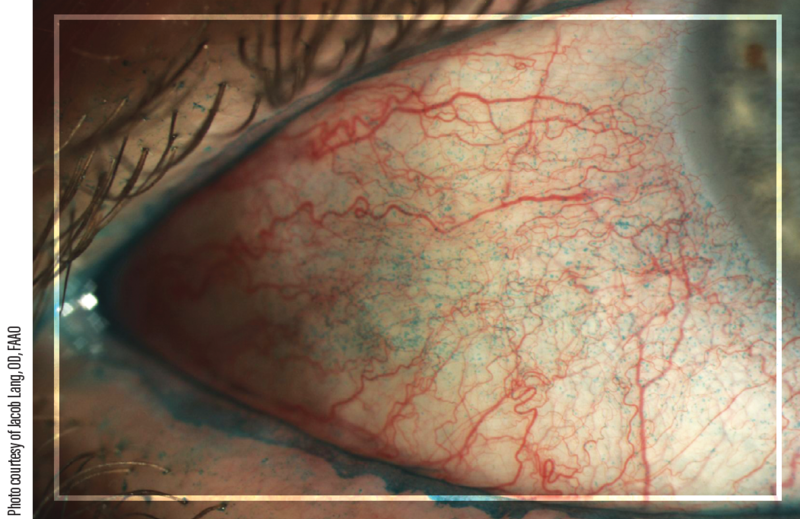 This article provides an update on relevant topical ocular therapeutics that are available or in the pipeline. Cyclosporine was initially isolated in 1971 from the fungus Tolypocladium inﬂatum Gams.1 Cyclosporine A is a calcineurin inhibitor that inhibits the inflammatory cycle by decreasing key cytokines involved in T-cell recruitment, activation, and amplification.2 Cyclosporine A also inhibits apoptosis by blocking the opening of the mitochondrial permeability transition pore, and the molecule has been shown to increase the density of conjunctival goblet cells.2,3 Goblet cells have important mucin production and immunoregulatory capabilities. 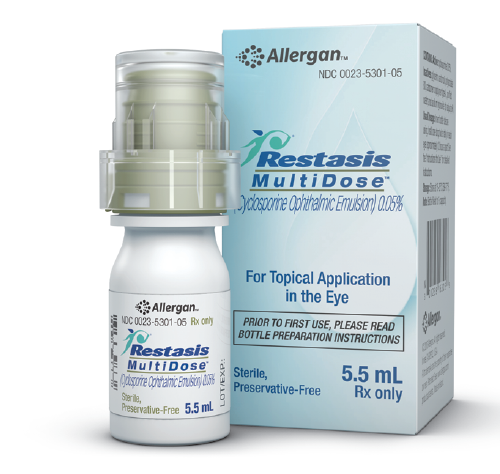 Until 2 years ago, cyclosporine ophthalmic emulsion 0.05% (Restasis, Allergan) was the only commercially available ophthalmic formulation of cyclosporine. Approved in 2003, it is the most prescribed branded eye drop in the United States, with 6.4 million patients treated, according to the manufacturer. Restasis is available in two forms. The original preservative-free vial is labeled to be used for a single instillation of the drops and then discarded. 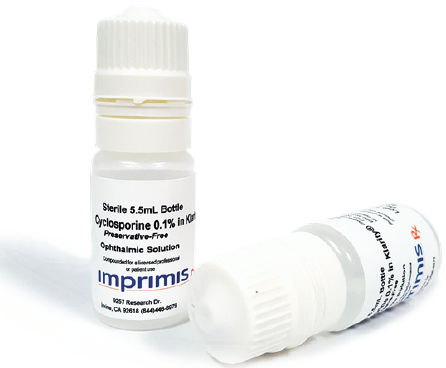 A newer option is a multidose bottle of the drug that is currently the only FDA-approved ophthalmic bottle for dispensing a preservative-free ophthalmic medication (Figure 1). According to Allergan, manufacturing of the single-use vials will continue at this time, so both delivery options are available for your patients. Figure 2. Lissamine green allows visualization of dead and devitalized cells on the ocular surface. Here, mild to moderate conjunctival staining is seen. Another option for an ophthalmic formulation of cyclosporine A is chondroitin sulfate/cyclosporine 0.1%, (Klarity-C, ImprimisRx; Figure 3). ImprimisRx operates as a 503B outsourcing facility, which means it is FDA-registered and required to meet Current Good Manufacturing Practice regulations to safeguard the quality and safety of compounded medications. Klarity-C is available in a 5.5-mL bottle and delivers twice the concentration of cyclosporine A as Restasis in a preservative-free vehicle. After a physician prescribes Klarity-C via the company website, phone, or fax, someone at ImprimisRx contacts the patient to arrange payment and direct delivery by mail. Medical insurance is not used. 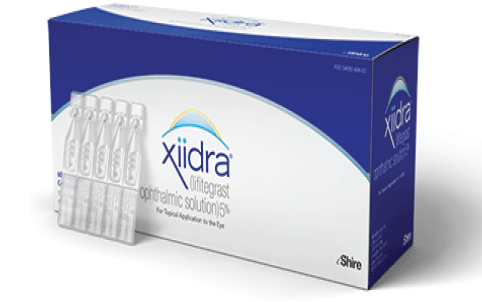 Xiidra (lifitegrast ophthalmic solution 5%, Takeda Pharmaceutical, formerly Shire; Figure 4) is the only drug indicated for the treatment of both signs and symptoms of DED. It differs from the immunomodulatory drug cyclosporine A in that it is an engineered immunoantagonist. It is classified as a lymphocyte function associated antigen-1 (LFA-1) antagonist, and it is the only medication with this novel classification. Lifitegrast’s proposed mechanism of action is to block T-cell activation by adhering to the LFA-1 site on T-cells, inhibiting those T-cell sites from binding to the protein intercellular adhesion molecule-1 (ICAM-1), an adhesion molecule that is expressed on the ocular surface and overexpressed in patients with DED.7-9 When a T-cell’s LFA-1 receptor is allowed to bind to ICAM, the result is T-cell migration and activation and cytokine release. These events increase inflammation, ICAM expression on the cell surface, and T-cells, exacerbating DED’s effects. Blocking this molecular “handshake” binding of the T-cell with ICAM improves DED signs and symptoms.9 In clinical trials, lifitegrast improved DED symptoms in as little as 2 to 6 weeks and signs in 12 weeks. Side effects are similar to those reported for cyclosporine, except for the addition of dysgeusia, which a minority of patients experience.10 This side effect is generally mild and is alleviated by drinking fluids or by dosing at bedtime. According to the manufacturer, Xiidra has been prescribed to 2 million people to date. Autologous serum tears have been used widely in specialty clinics for years to manage severe DED. Made from a patient’s own blood, autologous serum eye drops provide growth factors that, when instilled onto the ocular surface, promote epithelial healing and possibly maintain the health of an ocular surface prone to breakdown.11 A drawback to autologous serum eye drops has been that patients were required to visit a laboratory to have blood drawn. The blood is then sent to a specialized compounding pharmacy that makes the tears. Such pharmacies are not always locally available, and the process is expensive. 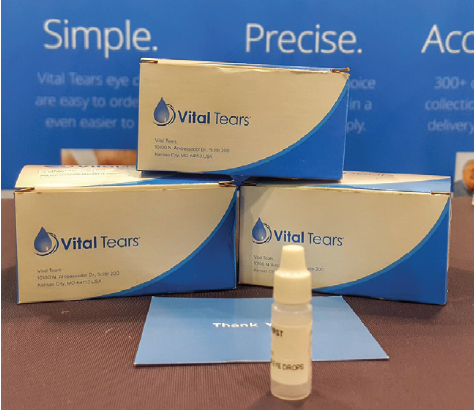 Vital Tears is a nationwide company that can provide autologous serum drops (Figure 5) by mail order. Patients may visit a local laboratory to have blood drawn and shipped to Vital Tears, which prepares and ships the serum drops. The prescribing physician places the initial order and refill approvals, and Vital Tears coordinates billing and shipping directly with the patient. In some cases, the company can even arrange for a mobile phlebotomist to draw the patient’s blood at his or her home. Improving access and reducing cost may increase the use of this treatment option. Figure 5. Vital Tears serum drops. Therapeutic options for DED are expanding. This growth, combined with the complexity and multifactorial nature of the disease, means that eye care providers must tailor treatment to the individual patient. A useful approach is to consider short- and long-term goals. Because lifitegrast begins to improve the signs and symptoms of DED relatively quickly, it can be a good first choice for patients with significant symptoms or for those who will require ocular surgery soon. Cyclosporine A is generally thought of as a broader-spectrum option with a slower onset of action. It may therefore be a more suitable alternative for patients who can wait longer for therapeutic effect or who can initially be given a steroid cycle pulsed dose. Despite the expanding options described here, DED remains undertreated. Based on data from the 2013 National Health and Wellness Survey, Farrand et al estimated that 6 million people have experienced DED symptoms but have not been diagnosed with DED.12 This statistic would be unacceptable for any other eye disease, and it should be unacceptable for DED as well. 1. Borel JF. History of the discovery of cyclosporine and of itsearly pharmacological development. Wien Klin Wochenschr. 2002;114(12):433-437. 2. Kunert KS, Tisdale AS, Gipson IK. Goblet cell numbers and epithelial proliferation in the conjunctiva of patients with dry eye syndrome treated with cyclosporine. Arch Ophthalmol. 2002;120(3):330-337. 3. Kymionis GD, Bouzoukis DI, Diakonis VF, Siganos C. Treatment of chronic dry eye: focus on cyclosporine. Clin Ophthalmol. 2008;2(4):829-836. 4. Pflugfelder SC, De Paiva CS, Villarreal AL, Stern ME. Effects of sequential artificial tear and cyclosporine emulsion therapy on conjunctival goblet cell density and transforming growth factor-beta2 production. Cornea. 2008;27(1):64-69. 5. Sall K, Stevenson OD, Mundorf TK, Reis BL. Two multicenter, randomized studies of the efficacy and safety of cyclosporine ophthalmic solution in moderate to severe dry eye disease. CsA Phase 3 Study Group. Ophthalmology. 2000;107(4):631-639. 6. Tauber J, Schechter BA, Bacharach J, et al. A phase II/III, randomized, double-masked, vehicle-controlled, dose ranging study of the safety and efficacy of OTX-101 in the treatment of dry eye disease. Clin Ophthalmol. 2018;12:1921-1929. 7. Anderson ME, SiahaanTJ. Targeting ICAM-1/LFA-1 interaction for controlling autoimmune diseases: designing peptide and small molecule inhibitors. Peptides. 2003;24(3):487-501. 8. Stern ME, Gao J, Schwalb TA, et al. Conjunctival T-cell subpopulations in Sjögren’s and non-Sjögren’spatients with dry eye. Invest Ophthalmol Vis Sci. 2002;43(8):2609-2614. 9. Zhong M, Gadek TR2, Bui M, et al. Discovery and development of potent LFA-1/ICAM-1 antagonist SAR 1118 as an ophthalmic solution for treating dry eye. ACS Med Chem Lett. 2012;3(3):203-206. 10. Donnenfeld ED, Karpecki PM, Majmudar PA, et al. Safety of lifitegrast ophthalmic solution 5.0% in patients with dry eye disease: a 1-year, multicenter, randomized, placebo-controlled study. Cornea. 2016;35(6):741-774. 11. Herbst RS. Review of epidermal growth factor receptor biology. Int J Radiat Oncol Biol Phys. 2004;59(2 Suppl):21-26. 12. Farrand KF, Fridman M, Stillman IO, Schaumberg DA. Prevalence of diagnosed dry eye disease in the United States among adults aged 18 years and older. Am J Ophthalmol. 2017;182:90-98.